It's all relative(s)! : Scotland, Syston, a workhouse... Crimea, Jamaica, Alabama, and a ghost town. Scotland, Syston, a workhouse... Crimea, Jamaica, Alabama, and a ghost town. Frederick Toon (born 1830) was the nephew of Elizabeth Toon (who married the butcher, Holyland): he was the son of Elizabeth's brother, William Toon (born 1803) and of Ann Toon nee Hartopp (born 1805). Frederick married Jane Charlesworth (born 1827), at Syston, in 1851. Jane's mother, Frances nee Adcock (don't be surprised if you keep hearing about Adcocks, there might be more of them than Toons in Syston), born in 1827, died in 1864, and her husband Thomas Charlesworth (born 1806) later remarried. His second wife was Christina Deacon, nee Elliott, who had lived on the same street -- once again, Cramp Street -- in Syston for at least twenty years. I'm fascinated by Christina, but she is a story for another day. Christiana had one son, John Deacon, from her marriage to John Deacon (bricklayer, born 1797) of Syston. She also had an older son, William Turner Elliott Deacon, born three years prior to her marriage to John Deacon. William was raised as John's family, taking the Deacon name in the 1851 census, when he was 14 years old, when he was in the Union Workhouse, in Rothley, Leicestershire, with step-dad John Deacon and young John. Christiana wasn't in the workhouse... she was in the house on Cramp Street. By the 1861 census, the two Johns and Christiana are reunited and all on Cramp Street... but William has disappeared. He wasn't in the UK census. I searched for him with both the name Elliott and Deacon. No William. Not in Leicestershire, not anywhere in the UK. I searched for his marriage. I searched for his death. I searched for crimes. Nothing! William was in the army... and in Jamaica! I've since found out that he served in the Crimean War, too. 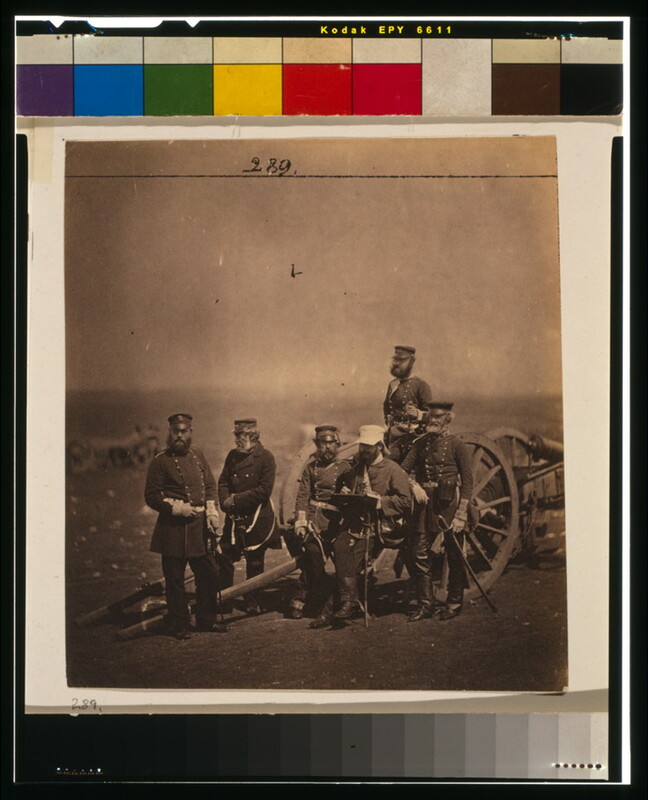 This photo shows officers of the 14th Regiment, of which William was a part, during the Crimean War. There is a wonderful collection of photographs by photographer Roger Fenton, preserved by the Library of Congress--you can see them all here. 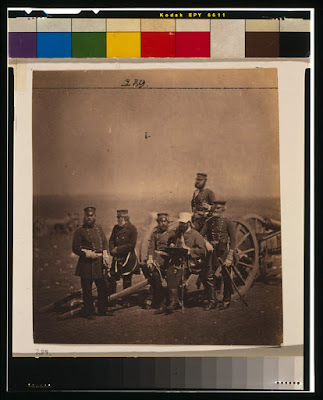 The Crimean War ran from 1853 to 1856. At school in England, we learned about Florence Nightingale, Balaclava, and the tragic Charge of the Light Brigade. It was a war whose cause is difficult to understand, and where so many men lost their lives to disease and sickness following wounds (which led to some revolutionary new procedures in battleground medicine). William Turner Elliott may have been part of that medical revolution, or at least seen battlefield medicine in action; on his next posting, in Jamaica, he was an assistant steward with the Army Hospital Corps, 1st Battalion of the 14th Foot (Buckinghamshire). William's Service Number was 3496. In Jamaica, he married Victoria Bunsendhall (whose name I have seen spelled in several different ways), who was either born in Germany in 1843, or was born in 1843 in Kingston, Jamaica, to German parents, depending on the record. The couple had three children: a daughter, Annie Victoria, who was born in Jamaica in 1866; another daughter, Louise, who was born in England in 1867 (I guess it was during a trip back home), and then a son, William Turner Elliot like his dad, born in Kingston, Jamaica in 1870. But then the family move, again. In 1873, aged 34, William takes his family to the USA. They arrived at Mobile, Alabama, in a year when Alabama saw a major outbreak of cholera--but this was mostly in Birmingham, AL, where at least 123 people died, and half the population of 4,000 people left the city. But this was more than 200 miles from where our Elliot family settled. So far, I have no clue why they chose to live in Beaver Meadow, Mobile County, Alabama, but that's where they lived, for many years. Beaver Meadow (the name of the local post office) was also called Beaver Mill, after the paper mill that was there, and where William worked. It was also the site of a uniform depot during the American Civil War--left-over fabric was used after the war to make bonded paper--but now it's all gone, taken over by the trees and the mosquitos. You won't find Beaver Meadow or Beaver Mill on today's maps: it's officially a ghost town. If you want to visit, go in winter, when the mosquitos are asleep. William Turner Elliot, born in Leicester, England, died in Alabama in 1882, reportedly hit in the stomach by a wrench (spanner)! Possibly the first person to be buried in Gulfcrest Cemetary (click here to see the cemetery courtesy of Google Maps). Here's a photo of his gravestone, and a synopsis of his history. The Post Office at Beaver Meadow shut down in 1906, but William' and Victoria's descendants were living there as late as 1920, then spreading out around Mobile County. I wonder why William and Victoria took their family to Mobile? It's another one of those 'why?' questions we may never know the answer too. Of course, knowing that there was an Elliott somewhere in my family, no matter how remote, I then had to go trace Sam Elliott's tree to see if he's really my long-lost-and-very-handsome cousin. Alas, it's not so: his Elliotts were in Texas, and possibly Alabama and Tennessee, way before our Elliotts set sail from Jamaica. But who knows? When I unravel Christina's secrets, and know what William Turner Elliot's mother's family had been up to, maybe we'll find that there were earlier Elliotts from England and/or Scotland in the American South. Settlers that link to Sam... and a possible reason for William to try Alabama after Jamaica. I'm not giving up on my long-lost-cousin yet. Heck, Sam Elliott was born here in Sacramento. There's no such thing as coincidence, right?